We went on a safari through Mole National Park and got to see many animals, including various types of antelope, baboons, warthogs, and most exciting and unexpected of all, a group of 8 elephants! We learned a lot about the park and the animals’ behavior and movements from the guides, but the most surprising thing we learned was that one of the guides was actually familiar with speech therapy and even with cleft lips, because a baby in his village had recently been born with a cleft. He said that no one had ever seen the baby, though. Our plan immediately became visiting the baby. In some communities in Ghana there is shame associated with children are born with disabilities. The child’s family members may not be able to get married due to belief that that family is tainted or being punished. Therefore, the mother of this baby had been hiding her 3 month old since the baby’s birth. 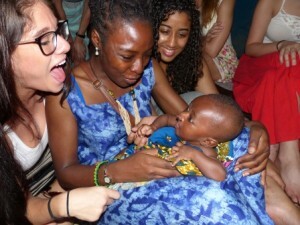 When we arrived to the village, we met the baby’s uncle who took us to the family’s home and agreed to translate for us. Even though her own brother had never seen her son, the mother allowed our entire group of 16 plus our Internal Affairs Senior Consultant, George Odoi, and his assistant, Nicholas Lutterodt, into her home. Dr. Crowley let the mom know that we work with children with cleft lip and palate all the time in the US and Ghana and that it is very common. We told her that we just want to make sure that her baby is ready to have surgery. The mom reported to have signed up for cleft surgery with one of the missions. The mother told us that when the baby was born the father refused to recognize the child as his son and left. He never returned. The mother and her son were forced to live with her parents since she had no way to support herself. She was crying as she told us this story. A quick assessment revealed that the baby met all developmental milestones for his age. He was alert and interested in all of us and did not seem frightened at all. We explained to the mom that the baby was beautiful and very smart. While Dr. Crowley held him, he put his head back at one point and the whole room was able to see that he had a perfectly intact palate. Dr. Crowley proceeded to tell his mom that once his lip is repaired he will be able to have perfect speech and live a normal life. Dr. Crowley asked to speak to a member of the father’s family to explain this as well, so that the father would know his son would be fine. The father’s brother came to the home and spoke to the mother and all of us and said he would tell his brother to come back and care for his family. We all donated money to help assure that the baby will have enough food to develop a strong body ready for surgery and that they would have transportation to the hospital. We saw that our little donation was going to make a direct impact on this baby’s life. The mom was crying from joy and when she bid us farewell, for the first time, she brought her baby out of the house and held him proudly.